Blow molding is done by machines that create precise hollow areas in plastic to form parts. The process begins when workers at a plastic manufacturing facility use industrial equipment to melt down plastic material. This melted material is then formed into either a parison (tube through which compressed air is force) or a preform, depending on the exact process that is used. A blow molded case can be made in many different shapes to accommodate specific objects. While the outside is usually rectangular and includes a carrying handle, the inside may have hollowed out areas that are designed to hold very specific things. Some blow molded cases are completely hollow inside, but most are made for use with a specific product and sold with that product. Extrusion blow molding – The plastic is extruded into the parison after being melted down. The parison is then cooled down in a tightly closed metal mold. As compressed air is blow in, the plastic hollows out and forms into the exact shape of the case mold. Injection blow molding – Injection blow molding is usually used for large-scale production of blow molded products. The melted plastic material is injected onto a core pin, which is then rotated over a molding station as it is inflated and cooled. The result is a hollow piece of solid plastic that matches the specifications of the blown mold. Injection stretch blow molding – Although an injection stretch blow molding processes is capable of manufacturing high volumes of blow molded products, it is also the most expensive. The equipment necessary for production can take up a significant amount of floor space in a manufacturing facility. The plastic is heated, formed, cooled and then reheated to finish the hollowing out process and create complex shapes. Polyethylene is a popular material for use in blow molded case manufacturing. Polyethylene offers many distinct advantages: it’s lightweight, very strong and rigid, tolerant of extreme temperatures, water-resistant, dent-proof, rust-proof and scratch resistant. Anyone who uses a blow molded case can be confident that whatever tool or device they place inside it will be well protected from damage. The versatility of manufacturing with plastic compounds like polyethylene makes it easy for manufacturers to created blow molded cases in a variety of colors. In a lot of industries, bright orange or yellow cases are preferred because they are more visible on a worksite or in the workplace. 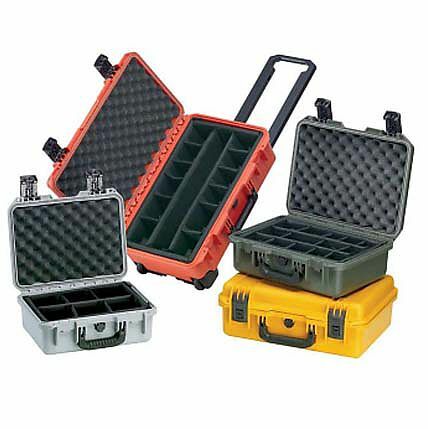 Blow Molded Cases A blow molded case is a tough carrying case that is used to hold tools, valuable electronic devices, heavy sound equipment and a variety of other items that may need to be protected during transport. Blow molded cases are manufactured using a high grade plastic solution, and as the name suggests, they are created using a blow molding process.